There are three things to note. 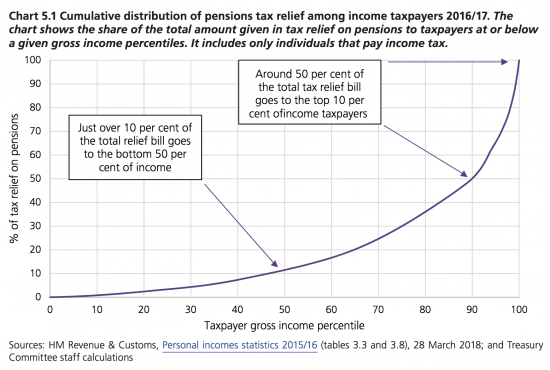 First, the lower half of the income distribution (broadly earning less than £24,000 pa in the year in question) get 10% of all pension tax relief. The so-called middle-income earners (earning £24,000 to about £54,000 in that year) enjoy 40% of tax reliefs. And the top 10% of earners, all earning over £54,000 pa) enjoy 50% of all tax relief. The total comes to £54.8 billion: the tax receipt offset is wholly bogus accounting that is utterly unacceptable under any accounting convention. In other words, tax relief for those best off - which is nothing more than a straightforward state subsidy for their savings which increases the wealth divide in the UK as a result - costs £27 billion a year. Comparison should not be made with housing benefit - since the vast majority of that goes to landlords, most of whom will also be in the top 10% of income earners. And it's hard to call pensions -which are paid almost universally - a welfare payment. Whilst unemployment benefits are almost insignificant. The other benefits come to £125bn. And the best off get a sum equivalent to 20% of that just to boost their wealth. What is the logic to this? It's almost impossible to discern. The Treasury Committee suggests reform to pension tax relief, giving it at a flat rate. I am beginning to question why it is given at all. Richard, what do you mean about the offset? The liability on pension payments? But the individual who has paid into the pension has to pay tax when they take money out, so in some instances the relief just defers payments for person who pays in. I am self employed and take advantage of the relief. But as I don’t play stocks and shares I hold in cash. Therefore although ultimately my tax bill may be slightly less in the long term, it is not by a lot. I view the slight reduction as comparable with an employers contribution, were I employed. Whatever the case I think some of the discussion about costs of pensions and taxrelief implies pensions are tax free when they aren’t at all. Is it not sensible to encourage people to save for the future? Particularly healthcare and to enjoy retirement after 40-50 years of working. It puts less strain on the strain. And why should we subsidise those who can already do so? Meant to say less strain on the state! It comes across to me as a self congratulating pat on the back since far too many of such high earners seem to be in Parliament these days. Or at least their spouses are well paid in the private sector. Democracy? This is the US version by the way by the Tories an New Labour. I hope that we do not have to get used it. which says that the top 10% contribute 27% of all taxes paid, and couple that with the figure that around 50% of the total tax relief bill goes to the top 10%, we have a total inversion of Adam Smith’s recommendations on progressive taxation. The neoliberal model would say that no-one should have any tax relief at all, and if you want to save or invest for your old age to live at a level above pensioner UBI then you should do it out of your after-tax income. The neo-libs would go further and abolish Stamp Duty so you can liquidate your house value more easily and under-occupied accommodation gets reallocated, and get rid of nanny state policies such as assuming pensioners can’t budget for winter or for the cost of a tv licence, just stick 7£ a week or whatever it’s worth on the PUBI ( pensioner universal basic income ). There wouldn’t be any tax incentives at all if they got a foothold. It just shows how far away they are. Well presumably top rate pension tax relief is an overhang from the days when the wealth gap wasn’t so big and it was a relatively marginal issue (ie there were much fewer top rate tax payers). And when pensions were mainly about saving for retirement rather than shielding wealth to be passed on to future generations. Having said that if we did do away with it, presumably we’d also have to overhaul the whole taxation system for income tax on pension income? Ie. someone who was taxed at the higher rate on income shouldn’t then be taxed (potentially again at the higher rate) on any post-tax pension income. Okay I get it. So those on a higher band (not me) get their 40% relief and then only pay 20%. For consistency it would be nice to see this argument articulated in an MMT terms I.e. we know the treasury does not need the money, but doing away with the relief would be more equitable and serve to reduce inflationary pressures on ABC that might result from PQE to support ‘investment’ in xyz. Is there any more granular data around the top end? people earning £50k in London can hardly be described as “well off” given the cost of living etc – anyone earning £150k plus has probably already maxed out their lifetime allowance so has stopped making contributions and therefore gets zero tax relief (I am an example of this), so essentially the most wealthy (top 1% etc) aren’t getting this relief at all which you might argue is the right answer? If the ‘wealthy don’t pay tax’, then they will not get the benefit of the tax relief on pensions which is the subject of the blog. As anyone knows, and the figures confirm, the top earners pay a significant proportion of the total income ta bill, despite representing a much smaller proportion. Not sure why you pretend this isn’t true? Earned income – taxed at source, dividends and interest are clearly taxed as income and gains on property and investments clearly taxed as capital gain – please explain how you can “divert”?? The one sector of workers who might dodge tax are the self employed where cash changed hands – don’t you agree? Maybe they are the wealthy you refer to? It should be blatantly obvious that the WEALTHIEST who are receiving the tax relief benefit will also be paying top rate tax when receiving their pensions, so they are purely receiving a deferral of tax not an absolute benefit. Further, you’d expect growth rates on fund to exceed risk free rates, so the next cost to the tax payer might actually be negative, as the net present value of the tax paid during the income phase could exceed the cost of the tax relief given. For other individuals, who may only be paying basic rate tax during retirement, the cost of tax subsidy is then the different between the two rates. To look at one side of the equation and ignore the other is disingenuous at best, deliberately misleading at worst. I guess if you make assumptions like this, which are wholly unrelated to reality, then you can suggest pension tax relief pays. But I will stick to what actually happens. Re more to tax – I know I have read your book and mentioned equity in my comment, but I still think every opportunity to drive home messages that any changes to tax laws are not efforts to balance budgets and pay for services would be helpful. Whenever we make the government spends first and then taxes we get the inflationary Zimbabwe example thrown back at us. Using that argument on its own seldom works. So why not try another framing tack and emphasise the other benefits of changes in tax regulation whenever one gets the opportunity? I’m not criticising, I just think some of these arguments are so intuitive that we need to take every opportunity to make connections. The tax preventing reducing inflationary pressures is a great one. .. Surely with National insurance and a top rate of tax of 50% then an average rate of tax on income is easily going to be 48% or more for high earners? Workers in the 20% tax bracket who are paying into a company pension have their contribution taken before Tax and NI. How do you think this should be treated for tax purposes? With auto enrollment, there is a big push on pensions, the employee contribution goes up again next year. So to be clear, your solution to your claim that the wealthy evade and avoid tax is to increase taxes on the wealthy. Hmm, I can’t see any flaws in that logic! And so your logic is we let them off? Now which do you think is going to work? CT deduction (generally) for employer contributions. Would you suggest scrapping all of the above? How would this fit in with the remaining defined benefit schemes that exist? Also, you have previously argued to use this pension money for people’s QE. Would these funds still be there if pension saving was restricted? Would you be giving different tax reliefs to encourage investment into such funds? The world has a glut of savings and the institutional form of pensions only contributes to this. As a result I would suggest the abolition of all tax relief on pension contributions. Tax has to be used to promote socially desirable activity: it seems savings are made without any encouragement so why offer the incentive? Consistency would be a start for a logical discussion. In response to your question on tax rates, top rate of 45% plus 2% Variable NIC gets you to 47% plus the fixed element of NIC on top. Remember high rate payers have zero tax free allowance. So c. 48% average tax is certainly feasible. If the maximum tax rate is 47% how is an overall rate of 48% over all income possible when the system is at least notionally Progressive? Might I suggest you are seriously out of your depth here? But that is nonsense, no such assumption is required. The relevant measure is the amount allocated to the pension pre-retirement (as that is what the tax relief is paid on) not the total income pre-retirement. You’ve also claimed that “…And that’s a world where pension returns can be less than the risk free rate as well, especially after fees”. Pension savings are made over a long investment horizon. The existence of an equity risk premium are surely beyond denial, even from you. There are minimally few examples of where long-term growth rates from equities, net of charges, would not have (comfortably) exceeded inflation. I think you are wasting the time of your readership if you don’t address genuine issues and try and hide behind lies to support your point. Are you seruosky suggesting people retire on real incomes higher than those they have when working? I think a little real world observation might help your analytical skills. Do you think that the long-term return on equities is higher or lower than inflation? 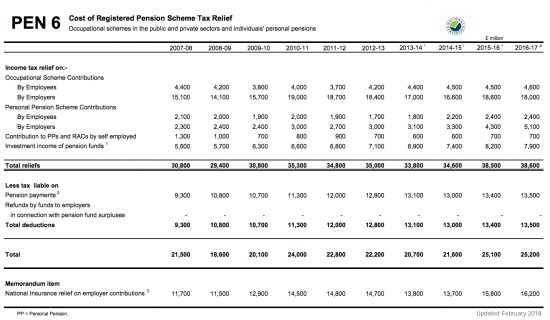 The bit that grates most with me is the absence of any NIC on employer pension contributions. After all, these are just wages passed into a deferral mechanism. Why shouldn’t they be taxed in the same way as wages? Employee contributions are. Why not employer contributions? Imposing Class 1 NIC (both primary and secondary and at the rates applicable below the upper earnings limit for the primary part) on employer pension contributions would raise massive amounts of revenue, partially redress inequality and inflict minimal amounts of pain. It would also be extremely simple to apply. The vast majority of so called wealthy people do not know how to avoid tax or divert income to capital gain. Maybe Russian oligarchs are different. The wealthy by enlarge employ the services of “wealth managers” e.g Brewin Dolphin, Rathbone, Smith &Williamson etc so I agree they hire experts.. do you think all of these firms are complicit in tax avoidance? Why haven’t you supplied this evidence to HMRC? The truth of course is that HMRC apply the rules as they are, not as you wish they should be. As usual, as soon as you find someone that challenges your answers wth facts you have to close them down for fear of having to back track on your own blog. it’s simply not the attitude of a credible ‘professor’, even if you were given that title rather than earned it. Do you really think theses firms are involved in “Panama papers” deceit? or something similar? Offshore planning may apply to people moving to the U.K. or planning to leave the U.K. For the vast majority of clients (UK based) the extent of their tax advise will be to maximise ISA allowances, SIPP contributions, exercise annual CGT allowances and providing information for annual tax returns… There is no evidence that in the U.K. the “wealthy don’t pay tax”..again for Russian oligarchs it might be different. The big 4 accountants may well be the “backbone of offshore” but they have nothing to do with the Wealth Management firms i have mentioned. Theses firms have circa £25billion under management for mainly UK clients so are significant. If you really believe they encourage evasion/avoidance you should confront them. You clearly won’t as you have no evidence. Yes I know the website well as I am a client of the firm. At what point does this tie in with “wealthy don’t pay tax” and firms like S&W are complicit with tax evasion/ avoidance? You are making a idiot of yourself with such foolish remarks and using a firms website as evidence. It is staggering!! .I had a brief conversation with a director at the firm and he suggested you should contact the them if you feel the firm engages in anything improper from a tax or regulatory perspective. Of course you won’t.